South Carolina is a state of the southeast United States bordering on the Atlantic Ocean. It was admitted as one of the original Thirteen Colonies in 1788. First visited by Spanish explorers in the early 1500s, the region was granted by Charles II of England to eight of his principal supporters in 1663. The territory was divided into the colonies of North Carolina and South Carolina in 1729. South Carolina was the first state to secede from the Union (1860), thus precipitating the Civil War. Columbia is the capital and the largest city. Population: 4,250,000. Following exploration of the coast in 1521 by Francisco de Gordillo, the Spanish tried unsuccessfully to establish a colony near present-day Georgetown in 1526 and the French also failed to colonize Parris Island near Fort Royal in 1562. The first English settlement was made in 1670 at Albemarle Point on the Ashley River, but poor conditions drove the settlers to the site of Charleston (originally called Charles Town). South Carolina, officially separated from North Carolina in 1729, was the scene of extensive military action during the Revolution and again during the Civil War. The Civil War began in 1861 as South Carolina troops fired on federal Fort Sumter in Charleston Harbor and the state was the first to secede from the Union. In the following years the state grew and prospered. With the invention of the cotton gin, cotton became a major crop, particularly in the upcountry. A new capital city, Columbia , was founded in the center of the state, reducing somewhat the political power of the lowcountry elite. Dissatisfaction with the federal government and its tariff policies grew during this period, however. In the 1820s South Carolinian John C. Calhoun developed the theory of nullification, by which a state could reject any federal law it considered to be a violation of its rights. Armed conflict was avoided during this period, but by 1860 tensions between the state and the federal government reached a climax. Unhappy over restrictions on free trade and about calls for the abolition of slavery, South Carolina seceded from the union on December 20, 1860, the first of the Southern states to do so. When Confederate troops fired on Fort Sumter in Charleston Harbor on April 12, 1861, the nation plunged into Civil War. By the beginning of the 20th century, South Carolina was starting to recover economically. The textile industry began to develop first, then in the years that followed other manufacturers moved into the state, providing jobs and economic stability. In recent years tourism has become a major industry, as travelers discovered the state's beaches and mountains. On September 21, 1989 Hurricane Hugo struck the coast, causing great damage to homes, businesses, and natural areas, but the state has made a remarkable recovery in the ensuing years. The second half of the 20th century also brought enormous change in the status of black South Carolinians. The civil rights movement of the 1960s brought a relatively peaceful end to segregation and legal discrimination. The most serious incident of this period occurred in 1968 at Orangeburg, where three black protesters were shot by state police. Two years later three African Americans were elected to the state legislature, and many others have subsequently served in state and local offices. As the century drew to a close, all of South Carolina's citizens were able to participate in the state's government and economy. David Robert Coker (1870-1938) conducted his early crop-improvement experiments on the family plantation in Hartsville. Beginning with 30 experimental cotton selections and methodically applying the latest techniques in the scientific breeding of crops, the work of Coker Experimental Farms played a great role in the agricultural revolution in the South. The state dance of South Carolina is the Shag! The only major league baseball player to wear the name of his hometown on his uniform was pitcher Bill Voiselle. He wore number 96. The Thoroughbred Racing Hall of Fame features champion thoroughbred flat racers and steeplechase horses trained in Aiken. The Black River Swamp Preserve is located near Andrews. This slow-moving river is characterized by high concentrations of organic carbon, which accounts for the tea-colored water and gives rise to the diverse habitats in its widespread floodplain. Batesburg-Leesville is home to the annual South Carolina Poultry Festival held in early May. Chapin is known as the Capital of Lake Murray. Tyler Brothers Work Shoe and Boot Company in Wagener produces 8 major brands of OSHA approved safety footwear, including such famous brands as Redwing, Georgia, Northlake, and Wolverine. The Edisto River Canoe & Kayak Trail covers 66 miles of the river for which it's named. The Edisto is reputed to be the world's longest free-flowing "blackwater" stream. "Blackwater" is a term that not only describes the color of the tannin-rich water, but also refers to the peaceful rate of flow that characterizes such rivers. The Argent train Engine No. 7 was donated to the town of Hardeeville upon the closing of the Argent Lumber Company. This narrow gauge train is a rarity and attracts many people from across the nation. The first boll weevil found in South Carolina is on display at the Pendleton District Agricultural Museum. Duncan Park Baseball Stadium in Spartanburg is the oldest minor league stadium in the nation. Every few years, Irmo has a sighting of some kind of water monster that inhabits Lake Murray. The monster first 'surfaced' in 1973 when residents of Irmo and Ballentine saw a cousin of the Loch Ness Monster. It was described in The Independent News in 1980 as "a cross between a snake and something prehistoric." A 24-mile motorcycle trail and a 26-mile horse trail are unusual features of Parsons Mountain Park in the Sumter National Forest. The Isle of Palms was originally named Hunting Island and then Long Island, it's thought to be at least 25,000 years old, and was first inhabited by the indigenous Seewee Indians. Johnston is called The Hub of the Ridge because it is located at the meeting place of the three river systems which flow away from the Ridge, a fertile plateau about thirty miles long between clay hills to the north and sand hills to the south. Johnston is known as the Peach Capital of the World. The Lake City tobacco market was established in 1898, and has grown to become one of the two largest markets in South Carolina today. Bomb Island on Lake Murray each spring and summer is the home of a very unusual event. Each year thousands of Purple Martins return to this island to roost for the summer. The island has been declared a bird sanctuary and it is quite a sight to watch these birds return to Bomb Island each day around sunset. At the Riverbanks Zoological Park in Columbia more than 2000 animals thrive in recreated natural habitats with no bars or cages. Little River is the Gateway to the Grand Strand. 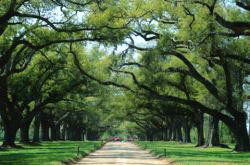 Giant moss-covered oak trees, that are centuries old, line its waterfront and many streets! There is an old saying in Marion that anyone who drinks water from Catfish Creek becomes infatuated with the area and wishes to remain there. In February 1852 William Burkhalter Dorn discovered the second richest vein of gold in SC history on the site of the present town of McCormick. Red Spider Lilies were first planted in the US, in the Willington-Mt. Carmel area when Dr. James Morrow sent them and other plants from the Orient while he served as surgeon with Commodore Perry’s expedition to open trade with Japan. The introduction of tobacco in 1894 rocketed Mullins into the Tobacco Capital of South Carolina. As many as 200 tobacco barns sprang up throughout the community. Warehouses were also constructed and the first tobacco sale took place on August 28, 1895. Housed in a 100-year-old freight depot, the Cowpens museum is a showplace for relics belonging to the crew of the USS Cowpens, a famous World War II aircraft carrier. Orangeburg is known as the "Garden City" because of its beautiful Edisto Memorial Gardens. The Edisto Memorial Gardens displays past and current award winning roses from the All-American Rose Selections. Summerville's beauty is mirrored in her motto, "The Flower Town in the Pines." Since the early 1900's day tourists have flocked to the town during early spring to enjoy millions of spring blossoms, particularly azaleas, in private and public gardens, including the mid-town Azalea Park. Fountain Inn is proud of the town's most famous native son. Clayton "Peg Leg" Bates lost his leg in a cotton gin accident at the age of 12; he overcame his tragedy to become a famous dancer. His signature step was the "Imitation American Jet Plane," in which he would jump five feet in the air and land on his peg leg, with his good leg sticking out straight behind him. During his career, Bates performed more than 20 different times on the Ed Sullivan television show more than any other artist. The Upper Whitewater Falls is the highest cascade in eastern America; it descends for nearly 411 feet. On Nov 2, 1954 Strom Thurmond became the first US senator elected by write-in vote. Thurmond received 139,106 write-in votes to win his seat. He defeated Democratic nominee Edgar Brown, who received only 80,956 votes. Beginning Labor Day and running through the following weekend, the South Carolina Apple Festival celebrates the beginning of apple harvest season in Oconee County, the largest apple-producing area in the state. The Columbia City Ballet, South Carolina's oldest dance company, has developed into one of the most broadly supported performing arts organizations in the state. This page was last modified on 17 January 2013, at 19:21.